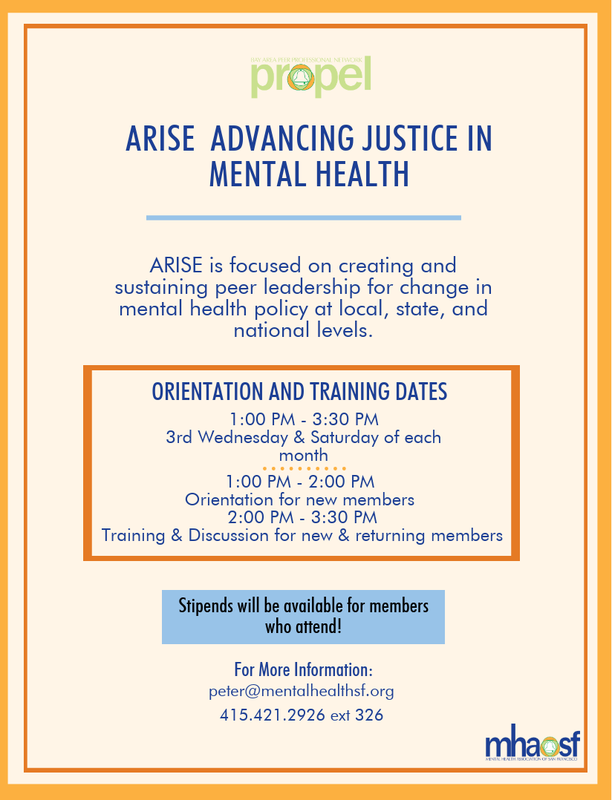 MHASF's ARISE is an advocacy program focused on developing and sustaining mental health peer leadership to create policy change at the local, state, and national levels. Are you an advocacy veteran? We need your experience, guidance, and mentorship. Are you new to advocacy and aren’t sure where to start? We provide introductory and ongoing training and support. If you're a peer or family member interested in mental health advocacy opportunities in the Bay Area, click below to register for a meeting today (meetings are held the 3rd Wednesday and Saturday of each month). If you are interested in ARISE, please take this interest survey to help shape our group's objectives. Want to stay current on ARISE efforts and activities? Join our Facebook page! For more information, contact Outreach Coordinator Peter Murphy at [email protected] or call 415-421-2926 ext. 326.